ONE of the ways that Portsmouth Cathedral is marking the 100th anniversary of the Armistice ending the First World War is by creating a Field of Remembrance on Cathedral Green around the War Memorial. 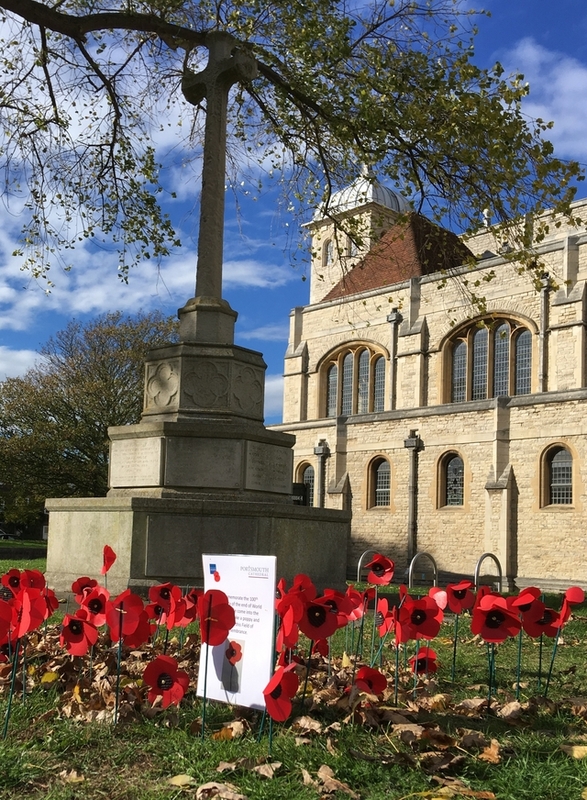 Members of the public are invited to visit Portsmouth Cathedral, in Old Portsmouth, make a poppy and place it in the Field of Remembrance on Cathedral Green. The War Memorial, resembling a medieval preaching cross, was designed in 1920 and commemorates by name those of the parish of Portsmouth who died in the First World War. A second plaque was designed to commemorate by name those of the Parish who died in the First World War. The memorial also commemorates those who died in the Second World War. Recent repairs and restoration of the Cathedral, including the tower, were made possible thanks to generous grants from the First World War Centenary Cathedrals Repair Fund. Two commemorative hoppers for water drainage were fitted on the western elevation of the tower with the dates "1914" and "2014", commemorating the centenary of the start of the First World War. To mark the anniversary of the Armistice the Cathedral will also be hosting ‘Standing in Silence’ a photographic exhibition from Monday 29th October until Monday 12th November, by artist John Farnhill, of some of the key sites of conflict from the First World War. Rather than seeking out the usual scars of war or the memorials that are so often pictured, these current, empty and organic landscapes invite the viewer to contemplate historic events and complete their own narrative. On Remembrance Sunday at 10:30 am there will be a Matins for Remembrance Sunday service and in the evening at 8 pm a Remembrance Day Concert featuring the premiere of a new Missa Brevis by Ola Gjeilo a new joint commission by the Cathedral and The Portsmouth Grammar School. There will be a collection box for donations to the 2018 Royal British Legion ‘Poppy Appeal’ in the Cathedral. More information should be available from Portsmouth Cathedral's website.